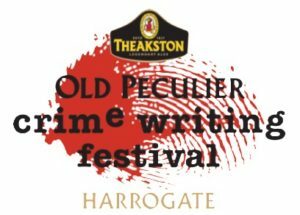 “Harrogate” – that’s what the regulars call the Theakstons Old Peculier Crime Writing Festival. After three days, I call it exhausting, energising, exhilarating. 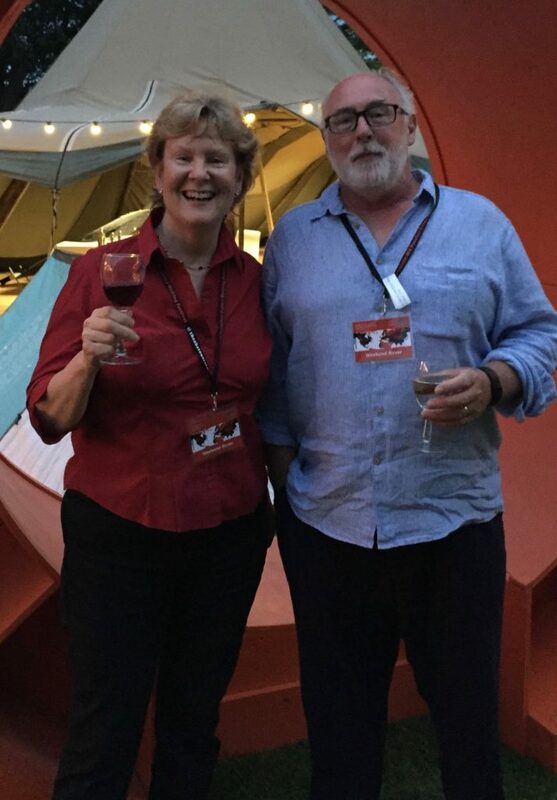 It was my second conference in July and I took the travelling easy. No point killing yourself before you get to Murder Central for the weekend! As a newbie, I was made very welcome, especially by my writing friend from the Alliance of Independent Authors, David Penny and his wife Megan. David’s a “Friend” of the festival and knows everything and everybody. I was also delighted to share a good part of Friday with Carole Blake from Blake Friedmann (BFLA) which represents me for ancillary rights and to renew my acquaintance with Isobel Dixon from BFLA. They were responsible for whisking me off to be filmed doing a short interview masterminded by Lara James for Peter James’s video channel. Juno knows what my hair looked liked; I just hope I didn’t burble. 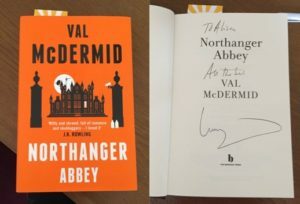 On the Thursday afternoon before the festival proper, I made my way to the Oxfam Bookshop where Val McDermid was scheduled to appear. Imagine how delighted I was to bump into her and her partner Jo Cox when I was panting up the hill on the way there. Both were charming; I just hope I wasn’t too fan-girly. 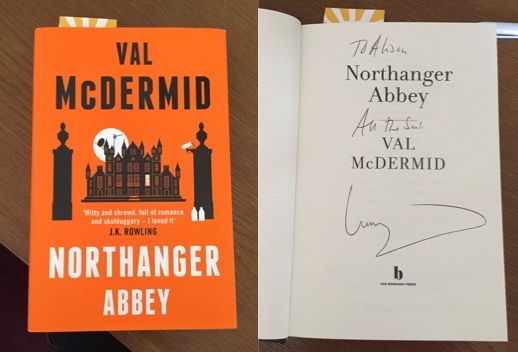 It was an excellent hour in the company of book people and Val signed a copy of her Austen rewrite Northanger Abbey for me. What a start to the weekend! 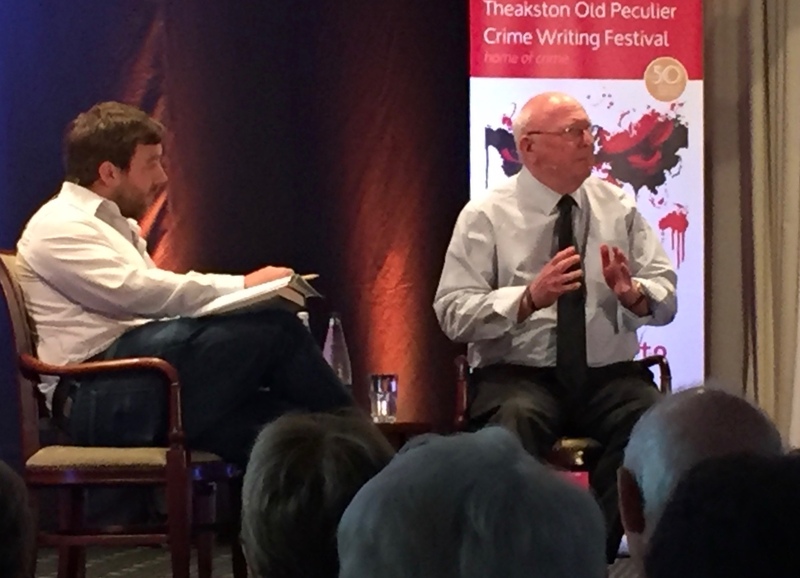 Celebs surrounded us and mixed freely; chats with NJ Cooper, Peter James, Steve Mowsby, Alix Gray (Bloody Scotland). If I had to pick out the best sessions I’d include the “Val and Sue show” (more properly Susan Calman in conversation with Val McDermid), Mari Hannah’s Book Club featuring P D James’s “An Unsuitable Job for a Woman”, the masterly Gerald Seymour raconteur extraordinaire and the political thriller panel especially Frank Gardener. 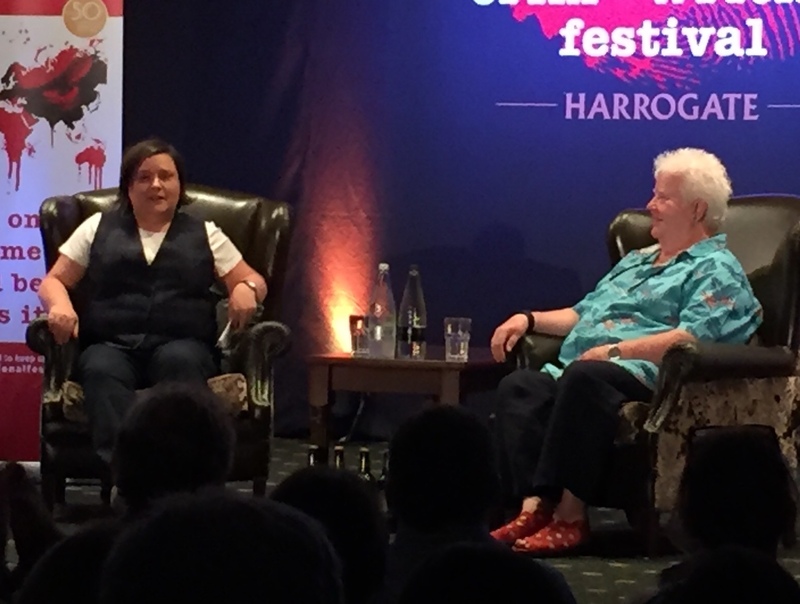 Martina Cole (interviewed by Peter James) just made us shriek with laughter. But the festival is about fans and pretty dedicated they are too. 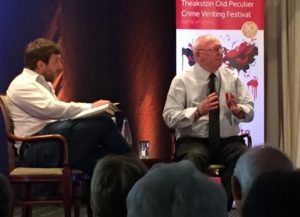 I had some lovely conversations, especially over meals and in queues. Confessing to be a thriller writer, I was pressed for information about my own work and handed out a number of Roma Nova cards. So, tired and happy, I trudged my way home to France. Would I recommend this festival? Undoubtedly. Book up soon for next year. Excellent day out and you enjoyed it. Making new friends and contacts, can only be good for everyone.x. It was a tiring three days, but I learnt so much as well as making new friends. As you say, Ray, very positive for everybody! I was there too for the first time as a reader/ reviewer and new blogger. What a great atmosphere. A super time. Wasn’t it just? And everybody was friendly and welcoming.